For the last few years, Angelina Jolie has been focused on a career behind the cameras. But now, Jolie may be joining one of Marvel Studios’ next films. According to The Hollywood Reporter, Jolie is in negotiations to star in The Eternals. 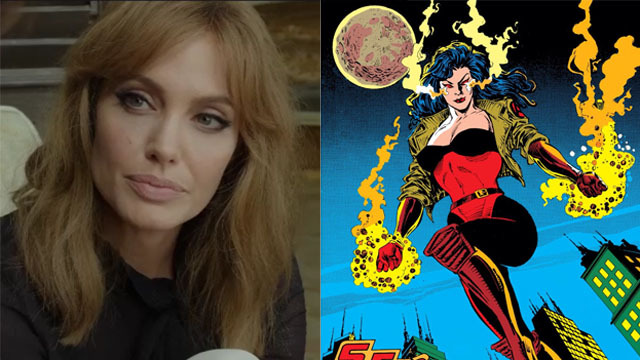 THR’s report doesn’t have any info on who Jolie would portray, but the lead female character in Eternals is Sersi. In the comics, Sersi is a member of the seemingly immortal Eternals who made a life for herself in New York City. During the early ’90s, Sersi joined the Avengers and remained with the team for four years. If Jolie takes the role, Sersi seems to be the most likely choice. Alternatively, Jolie could portray a different character or even one of the villains. What we do know is that Eternals will put its focus on Sersi and Ikaris, and their centuries spanning love story. As conceived by Jack Kirby in the ’70s, the Eternals and their rivals, the Deviants, were offshoots of humanity created by the Celestials. Marvel’s Guardians of the Galaxy films have already established the Celestials in the MCU. Even Thanos, the Mad Titan, is an Eternal, although none of his previous appearances in the films have acknowledged that. Chloe Zhao is directing The Eternals from a script by Matthew and Ryan Firpo. Marvel hasn’t set a date for the film, but more details may follow after Avengers: Endgame. Are you excited about Angelina Jolie’s potential superhero role? Who do you think she should play in The Eternals? Let us know in the comment section below!